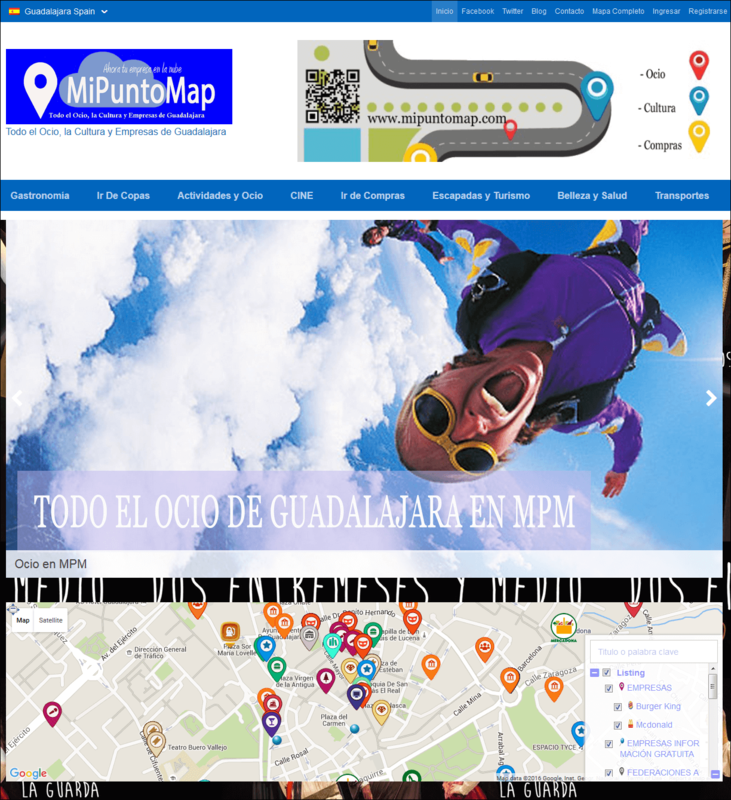 Owned by Juan Fernandez – a broker, “MiPuntoMap.com” is city portal for the city Guadalajara, near the Spanish capital, Madrid. 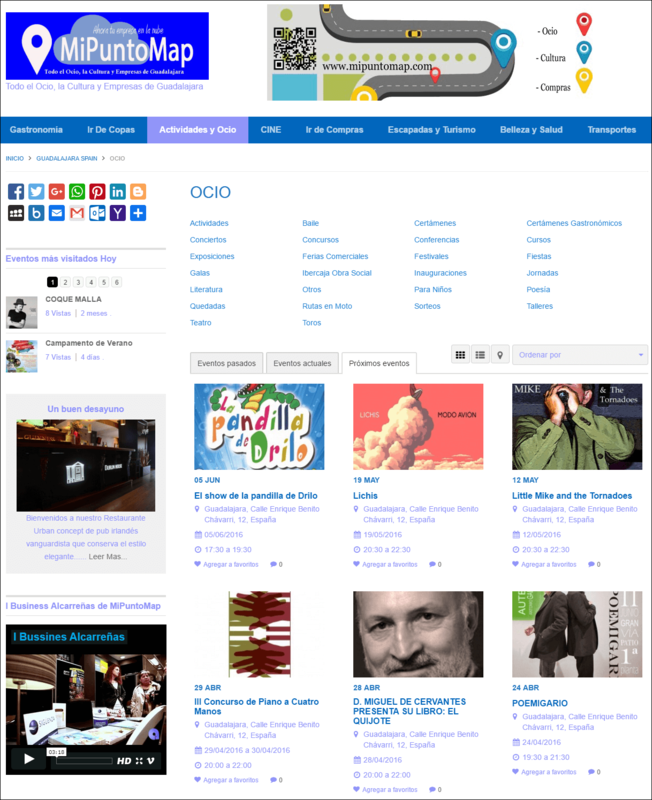 The site is built using the Templatic Directory template. 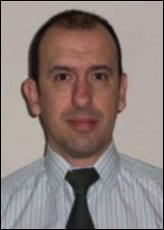 We have asked Juan a few questions about his project of building this comprehensive and successful website. Juan was kind enough to spare some of his valuable time to share with us some of the aspects of his success story with his Guadalajara portal. The main purpose for developing the MiPuntoMap was to offer the people of Guadalajara, the facility of a city portal, where they could find everything related to entertainment, culture, etc. at one stop. This saves them from the drudgery of going through different sites and finding the relevant content. Thanks to the google maps integration and location based facilities of the Templatic Directory template. MiPuntoMap is currently selling movie tickets, theater and concerts, as well as codes discounts for hotels, cruises, tours and travels. This provides the opportunity to attract a larger audience. The company was started with the aim of providing the people of Guadalajara the benefit of having a city directory. All the businesses we desired to list on the MiPuntoMap are at street level and they could be visited personally. So instead of sending mails to the prospects, I preferred visiting them personally and explaining them the new platform I had to offer, and its benefits for them. Any greater business needs time and efforts, and in order to obtain greater success, this work must be continuous. With a tough competition in the area, It requires patience, efforts and dedication to keep growing. I am also planning to hire more staff, for insertion of events and for marketing MiPuntoMap. For improvement and new possibilities and opportunities, I’m also looking for new collaborations at the institutional levels. I have faced many challenges and am still facing some. To develop a guide of the companies of Guadalajara, the challenge was to find out the companies who wanted to hire this type of advertising. I got started with social networks, to start getting visitors on the site. Eventually, I launched small marketing campaigns in the streets of the city, making the people aware of what MiPuntoMap is! Taking in the account, the taste and the needs of the people, I’ve also made several visual changes to the portal. I’m still thinking to give it another visual change. Currently, there are many other web-sites and platforms which provide the similar services, the biggest challenge is to be unique and different from them. I was benefited by the SEO friendly theme. And in turn, I offer my users the benefit of discovering the information about various businesses in the area at one place. They can also buy tickets for the events from our site and get discounts. I am determined to keep going with the current improving technologies and integrating more and better payment options. In short, I have made it possible to benefit both, the businesses and the users of our site. The businesses are getting a new display window for their business. The users are getting the integration of events, facility of buying tickets online and also finding the highlights of the listings in the area at one place. How it benefits the listing owners? The listing owners, get advertisement space on the MiPuntoMap by getting their listings published on the site. By publishing their listing on the site, I provide them the links to our site and they use the social network, to share the links of their listing and attract the attention of people at large. MiPuntoMap was started with very basic features. But now, emphasizing the need of constant improvements and the needs of current situations, I am trying and integrating more plugins. I have used MailPoet Newsletter For automated newsletters, emails, post notifications and autoresponders. Further, I’m proposing to integrate the FB Events plugin that will import the events from the facebook to my site and save my time so that I can optimize the other parts of MiPuntoMap. I have advertisement banners of private companies as well as the partners on the site, this helps to earn income as well as visits to the MiPuntoMap. I have also planned to offer movie tickets, concert tickets, and Networking sessions to the users. I want to increase the subscriptions of users, to offer deals to different customers, introducing a new form of monetization for MiPuntoMap platform. I get a small part of revenue from the ad banners and rest from the business spaces where the companies can get their business listed. An application with locator maps is what I want most. An integrated app that runs on different systems like mobile phones and tablets would be a great enhancement. Many clients want it that way, so, it would be a key success factor for MiPuntoMap if it can be made available as an app. I think its availability as a map will not only increase the sales of the tickets, the number of visitors but also effect the potential businesses who wish to get listed on the site. At last, thanks Templatic, for this opportunity and great job with this type of Topic. This was Juan’s motivating story about his web-directory MiPuntoMap.com. He has kindly shared with us his plans, vision and purpose for creating and maintaining his directory for Guadalajara. Thanks Juan, it was great to have these candid answers to our questions. Good luck for the future campaigns of MiPuntoMaps. Well done Juan your site looking very nice. I also agree with your suggestion for integrated mobile app. Thank you. Anurag, for your comment. I take this opportunity to thank all the team templatic, their hard work and effort for this wonderful template. Thank you Juan for your kind words. Clients like you always keep us motivated to continuously do the new and improvised efforts.